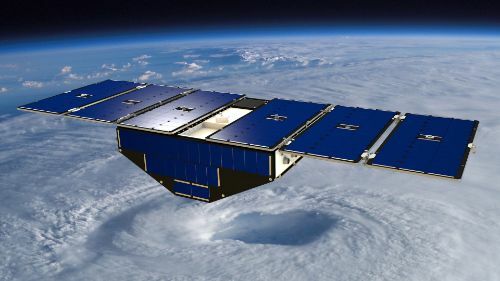 The goal of the eight CYGNSS satellites is to remain active for two hurricane seasons, building a constellation in a non-synchronous orbit to deliver high-revisit rates with measurements of wind data within tropical storms roughly every six hours. The CYGNSS Satellite Constellation operates in a non-synchronous near-circular orbit with all spacecraft deployed into the same orbital plane, orbiting 510 Kilometers above the Earth at an inclination of 35 degrees to either side of the equator. 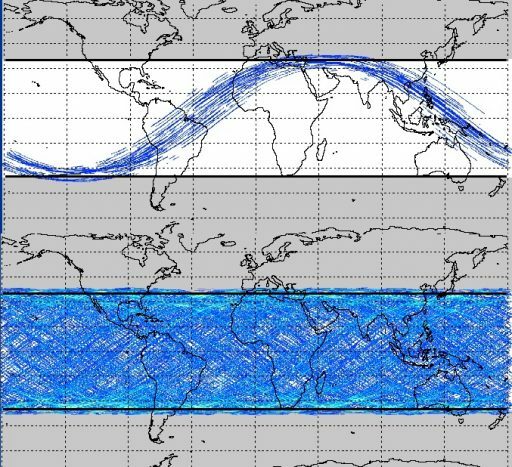 The orbital inclination was selected to optimize the revisit time for the tropics and mid-latitudes where the vast majority of events occur that are of interest to the mission, in particular hurricanes and other tropical storms. 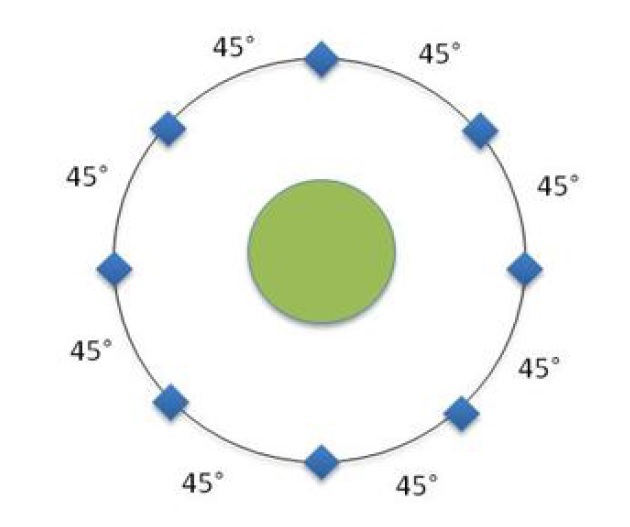 Selecting a 35° inclination increases the dwell time for latitudes at which hurricanes are most likely to occur in order to maximize the temporal resolution of wind data collected by the constellation. 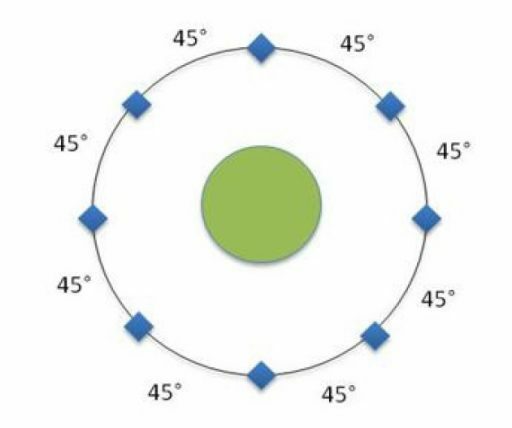 At the desired distribution of the eight satellites at 45 degrees in their single orbital plane, the constellation can achieve a mean revisit time of six hours. Because of the nature of the CYGNSS microsatellite constellation, there are no means of active propulsion on the spacecraft which is typically used in constellation missions to set up a precisely controlled geometry between the members of the constellation to maximize coverage in terms of revisit time. Although there are now delta-v thrusters on the CYGNSS satellites, there are ways of actively controlling the spacing of satellites within the constellation. The CYGNSS spacecraft make use of a ‘differential drag’ technique to phase the individual satellites to their appropriate positions within the constellation. 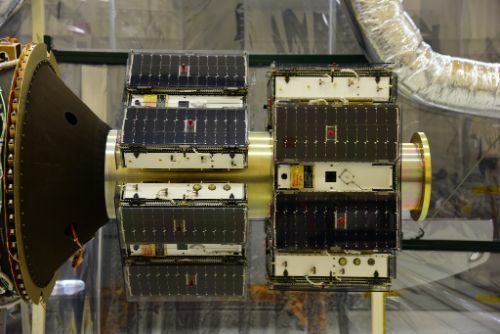 Because of their shape, the satellites have a 7:1 drag profile – the highest drag is possible by facing the zenith-side of the satellites with the deployed solar arrays to the direction of travel while the regular satellite orientation offers the lowest drag. 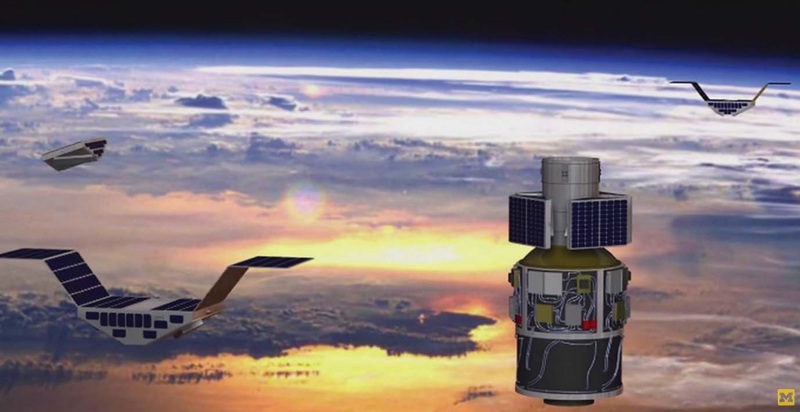 Individual satellites will be slowed down slightly by placing them in the high-drag attitude, thus causing the constellation satellites to drift apart with minimal impact to the orbital lives of the satellites. Although properly phasing the satellites is easily achievable, the mission faces the difficulty of disturbance of the constellation by atmospheric drag and conjunctions. Small uncertainties in vehicle state (attitude error) will amplify over a period of months and cause a small drift between the individual observatories that has to be corrected to maintain the constellation within the selected tolerance. Conjunctions with other space objects may require CYGNSS satellites to slightly alter their orbits to move out of the potential collision box. 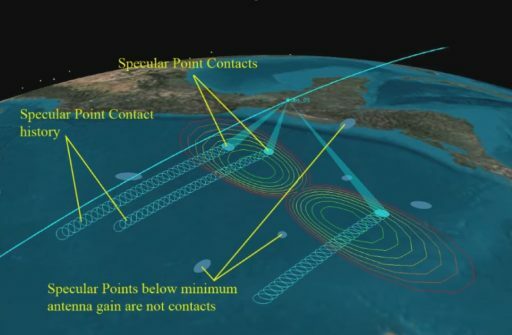 Because the satellites can only vary their orbit via negative acceleration through drag, a Debris Avoidance Maneuver by one satellite would require orbital adjustments by all other constellation satellites in due course to maintain the desired phasing of the satellites. Analysis of the orbital debris population has shown that CYGNSS will face conjunctions to within two Kilometers on a weekly basis and closer encounters within 0.5 Kilometers about once a month, making conjunctions the dominant disturbance to the constellation. 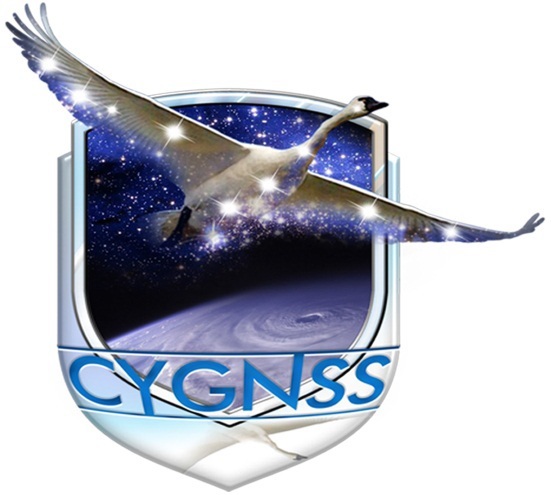 The CYGNSS mission is planned to start with a two-month commissioning and calibration/validation phase which also permits sufficient time for the initial phasing of the satellites into the operational constellation. During the two-year science phase, all satellites are operated at 100% duty cycles with the instruments powered at all times except for a brief two-week calibration and maintenance period once every six months. 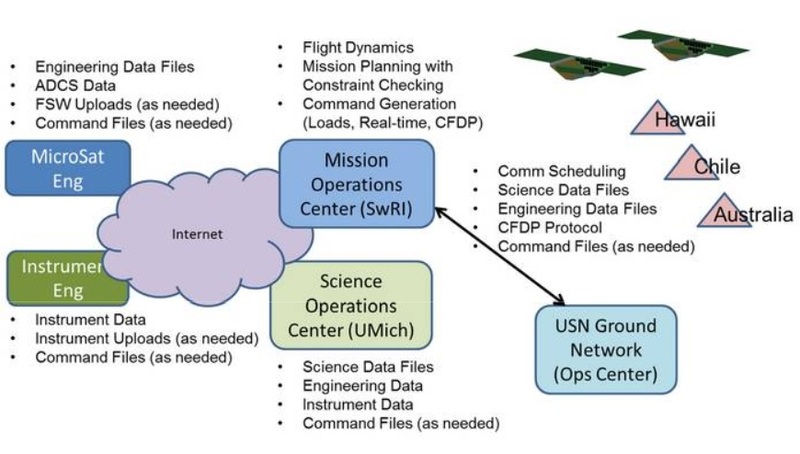 Three principal components make up the CYGNSS Ground Segment – the Mission Operations Center located at the Southwest Research Center, the Science Operations Center at the University of Michigan, and the Ground Data Network operated by Universal Space Network Ltd. with ground stations in Hawaii, Chile and Australia. The Mission Operations Center is responsible for all operational tasks including mission planning, flight dynamics and constellation management, command and control tasks for all eight spaceborne observatories. MOC’s tasks include the coordination of activity requests, scheduling of ground station passes, maintaining the ground-based data processing system, distributing engineering and science data, generating command procedures for satellite operations and orbit control. 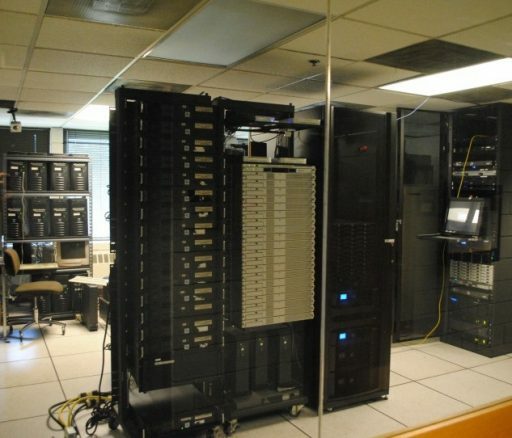 The Science Operations Center deals with all tasks related to the generation of data products starting with the testing and validation of the DDMI instruments pre-launch and during flight, planning science operations schedules, providing instrument commands to the MOC, processing science data up to Level 3, archiving science data products and distributing data to users. 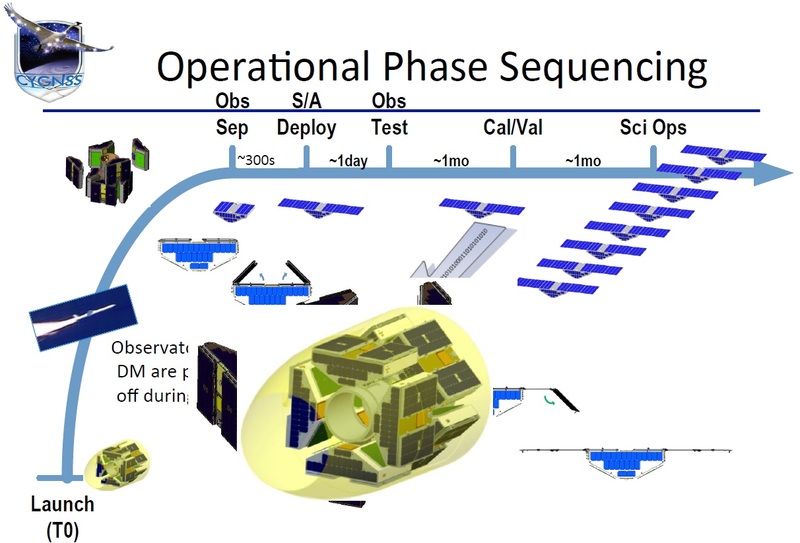 Typically, the CYGNSS satellites operate at a 100% duty cycle, not requiring any requests for science operations, however, researchers can request enhanced data sampling on special interest events. The Ground Data Network employs three ground stations part of the Universal Space Network plus a tracking station at MOC with an average of eight minutes of visibility per ground station. Each CYGNSS satellites will pass over the three ground stations 6-7 times per day, providing a large number of scheduling opportunities. Copyright © 2019 CYGNSS | Spaceflight101. All rights reserved.